VISUAL JAPAN SUMMIT Adds More Bands to Their Line-Up! | VKH Press – J-Rock & Visual Kei Coverage Worldwide! Home / News / Tours / VISUAL JAPAN SUMMIT / VISUAL JAPAN SUMMIT Adds More Bands to Their Line-Up! 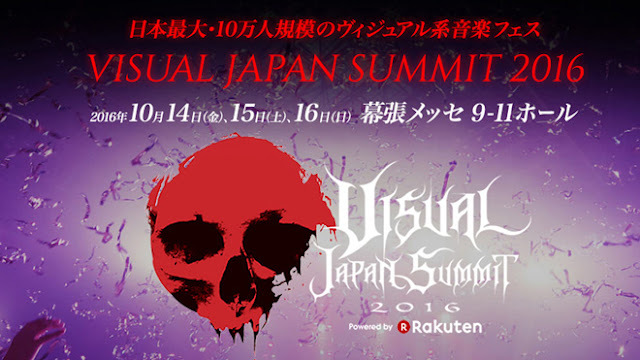 VISUAL JAPAN SUMMIT Adds More Bands to Their Line-Up! The world's biggest visual kei festival VISUAL JAPAN SUMMIT has just announced a whole slew of new artists to join X JAPAN, LUNA SEA, GLAY, Golden Bomber, and hide with Spread Beaver! Despite having announced a huge number of artists, there seem to be more that will join this impressive list.